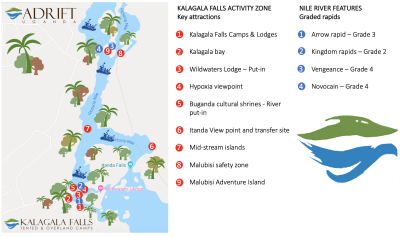 Experiencing the Nile with the whole family can be an experience that is both rewarding for the parents and the children. Adrift offers a section of the river that is pristine and safe for our family groups and also allows them to see some of the most remarkable rapids on the River Nile, all from a safe distance. We tailor each trip to the specific needs of your family – whether you have a family full of adventurers or first-time rafters, we will ensure you have one of the best days ever on the River Nile. The adventure on the river is complimented by access to our ‘Malubisi Adventure island’. Here you will have the opportunity to explore the surrounding areas while your guides prepare a BBQ lunch and cold drinks. The island is nestled between 2 Grade 4 rapids and for the adventurous, we can offer a taster of our full package experience, by rafting the lower section of our aptly named ‘Vengeance’ rapid. If they are still building their confidence we can then walk them through the island allowing access to the quieter pools below the island.